As the most joyous of seasons comes to the Amish community of Wells Landing, Oklahoma, one young woman gets a chance to start again—and rediscover the gift of true love . . . Families rejoicing together, caroling parties full of cheer, and church get-togethers brimming with delicious cooking and warm fellowship. 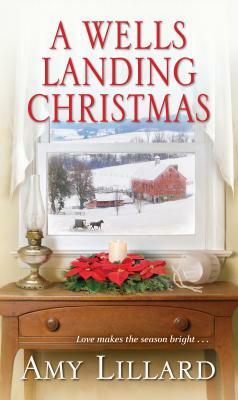 Ivy Weaver would give anything to be a part of Christmas in Wells Landing. But one reckless mistake made her an outsider, and it's all she can do now to tend to her ailing grandfather and make a living. She sure doesn't need Zeb Brenneman returning to help after he abandoned her for no reason. He's working hard to make amends, but Ivy isn't sure there's enough faith—or still-sparking love between them—to stir her forgiveness . . .
challenging—and precious—Christmas gift of all . . .
Amy Lillard is an award-winning author of over forty novels and novellas ranging from Amish romance and mysteries to contemporary and historical romance. Since receiving a Carol Award for her debut novel, Saving Gideon (2012), she has become known for writing sweet stories filled with family values, honest characters, a hometown feel and close-knit communities. She is a member of RWA, ACFW, NINC, and the Author’s Guild. Born and bred in Mississippi, she now lives with her husband and son in Oklahoma. Please visit her online at www.AmyWritesRomance.com.